I used the play dough cookie recipe that I have used a couple of times before. It's a soft bite and a tasty cookie. They were as easy as pie to make:) I merely added blue food coloring to some of the dough for the blueberry pie cookies, and red for the cherry pie cookies. I left the pie "crust" as is. I did flute it too, but unfortunately it didn't keep its shape very well. Hence, the crostata look. 2. In a medium bowl combine flour, baking powder and salt. Add dry ingredients to the creamed mixture. Stir till soft dough forms. Divide dough into thirds. Tint one portion red and another portion blue. Wrap in plastic wrap and chill for 2 hours. 3. Preheat oven to 350 degrees F (175 degrees C). 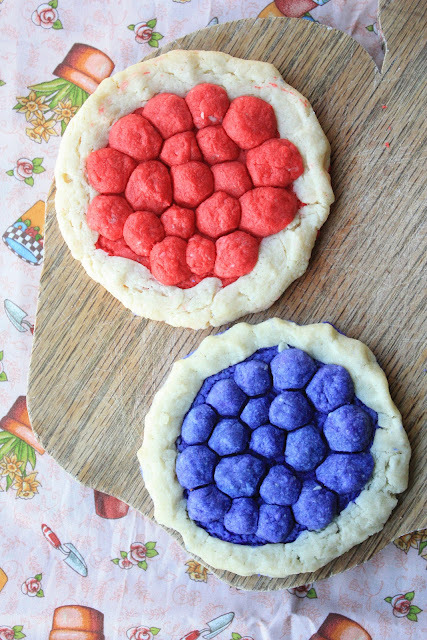 Roll out the red dough and cut with round cookie cutter(mine was 3 1/2 inches) to make a "pie". Pinch off some of the plain dough and roll into a rope for the "crust". Place it around the edge of the red "cherry" disc, and flute. Use another portion of the red to make small dough balls for the "cherries". Do the same with the blueberry pie cookies. 4. Bake cookies for 8-12 minutes or until lightly browned. Cool and store in an airtight container. Makes about 10-12 (3 1/2 inch ) pie cookies. Tasty Tuesdays at 33 Shades of Green. These play dough cookies are so "playful". 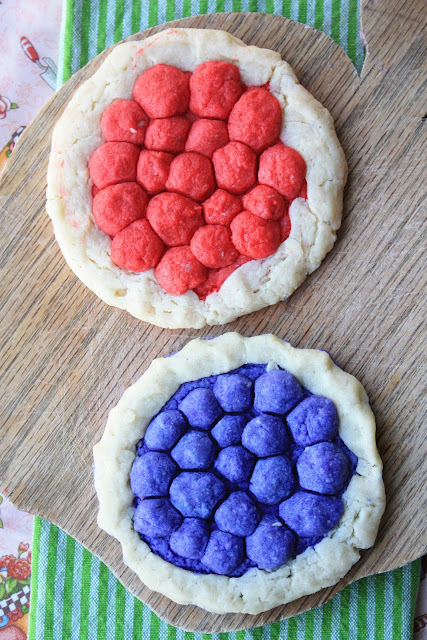 love your imagination of making the colourful doughs into berries within a cookie dough. How very bright ! I imagine that children would love these. these are so fun, awesome idea! You have such a cookie talent :D These are so creative and original, yet another cookie idea I've never seen before! Those are so cute. When my oldest son told me they were celebrating pi day on the 8th (because of spring break this week) I thought I should hurry and make something to post, but of course the best laid plans.... I am glad to see you are completely on the ball and turned out something adorable as usual. Such a fun idea and great way to celebrate Pi day. My daughter would love this project! What a cute idea. These are very fun, well done! Ctuest pies I've seen all day. These are darling. You need to photograph your sweet cookies and sell stationary using them. They are all so cute. Each one better than the last. Great pie cookies for Pi day! I love the berries! This blog is definitely the go-to spot for the best cookie ideas. Another fab recipe, Sue! These are so cute! What a clever idea.